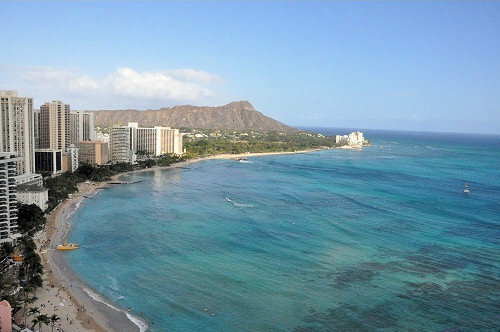 Diamond Head is one of the most recognizable landmarks in Hawaii. When I wrote that I have lived in Hawaii since 1973, there was some speculation as to whether there might be other Burbank High grads who live in the islands. And so far, three other classmates have contacted me with updates. Judie Anderson lives on Maui. Judie Anderson writes: I saw the article from Katherine Crosier about the Burbank “B” and that she lives in Hawaii. I moved to Maui in 1981. Just wondering if there are any other BHS alumni here in the islands? It would be fun to meet old friends that live nearby! Thanks for doing this blog. Even though I ususally don’t visit blogs or the internet much for that matter, I will be checking in and saying hello and see who is out there. But Judie, you look gorgeous! 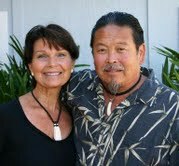 Jackie Casimano (Lena) and her husband, Kenneth Hiraoka. 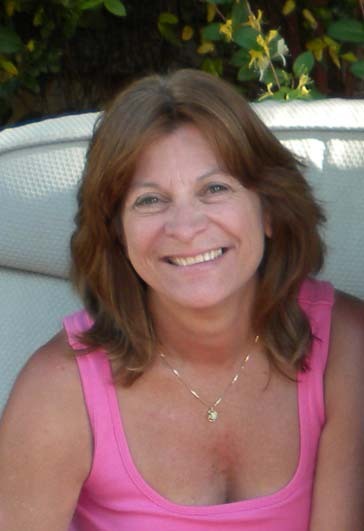 Then I heard from Jackie Casimano, who writes: I never felt comfortable as Jackie, so changed my name to Jacalina, adopted Lena as a nickname, and that’s how people know me now. On my second marriage, but use my maiden name, Casimano. I was very pleased to find your email. Haven’t really been involved with keeping in touch, but the blog really touched my heart. Just a quick update on my life: I’ve been living on Maui since 1992, and teach art at Kamehameha Schools, Maui Middle School Campus. My sister tried to encourage me to attend our 40th reunion, but I just didn’t go. Seeing the photos and reading about the classmates who attended and the staggering number of ones who have departed this world really moved me. I found myself suddenly aware of how short life can be. She married her second husband, Kenneth Hiraoka, in 2003. He is an artist who specializes in Hawaiian cultural arts, especially ivory hooks, and has two galleries on Maui. Sooner or later, everyone gets to Hawaii. If you are planning a trip, contact me and maybe we can have a mini-BHS reunion! Posted by Katherine Crosier on January 8, 2012 in Burbank High School and tagged Bob Mara, Burbank High grads in Hawaii, Jacalina Casimano, Jackie Casimano, Judie Anderson, Nancy Munro, Nancy Munro Slayton, Nancy Spaulding, Nancy Spaulding Mara.